Marie Munk was the youngest daughter of the regional court judge Wilhelm Munk and his wife Paula in Berlin. She had one brother, Ernst Munk (judge) and one sister, Gertrud Munk (artist). Marie completed her school education after 10 school years. The educational policy did not allow girls a high school education. She became aware of the different rights of women and men when her brother began his studies at the university. Marie Munk became a kindergarten teacher and took part in social work in auxiliary groups of Alice Salomon. In the high school courses for girls of Helene Lange, a leading figure in the women’s movement, she prepared for academic entry requirement for the university and was successful (1907). After lecturing in psychology, philosophy and national economy she decided on jurisprudence studies as an auditor. Women were not allowed to study in a German university until 1908. Only after 1908 in Germany were they allowed entrance to all universities to study all subjects. They were not permitted to sit diploma or other examinations, so their university studies without proof of graduation were worthless and women, despite having successfully studied, still had no right to claim any professional academic qualification. They were however barred from sitting diploma or other examinations in a German university until 1920. Although gender-neutral regulations at the universities precluded discriminatory interpretations of the law of the German Empire concerning women and allowed the full matriculation of young women up to 1908, they were still not granted a diploma or passes by the university until the 1920s. Marie Munk therefore completed a doctorate after 8 semesters in the liberal Ruprecht-Karls-University in Heidelberg (1911). Only after the nomination of the Prussian Minister of Justice (1919) and the introduction of the law on the licensing of women for occupations in the practice of law (1922) was Marie Munk allowed to sit and pass the first and second juridical state examinations (1920 / 1924). She worked until then as a legal clerk in a law office in Bonn, in Berlin companies and the Berlin administration. She founded with Margarete Berent and Marie Raschke the German Women Lawyer’s Association (1914), the forerunner of the DJB (Deutscher Juristinnenbund). As the first female lawyer in Berlin (1924-1929), her engagement was indicative of the family rights reforms in the Weimar period in the legal commissions for the Union of German Feminist Organizations (Bund Deutscher Frauenvereine). Her publications (68) on matrimonial law, marital property law and divorce law were acknowledged among experts. She achieved with prominent support her goal to become a judge in August, 1930. She founded an international occupational network for women from the most varied professions (Business and Professional Women’s Club Germany, 1931). On March 31st 1933 Munk was suspended and dismissed on the May 22nd from judicial office without pension rights because of her Jewish origin. After a visit (1933-1934) to the USA, she ultimately became a resident there in 1936. With scholarships for her lecture tours and as a guest expert at Hood College (Maryland) and Sophia Smith College in Northampton (Mass. ), she was able to make a living (1938-1941). She had influence in the American matrimonial law, marital law on property, divorce law discourse in the National Conference on Family Relations and in the Committee on Family Law of the National Association of Family Relations together with other experts who had fled Germany, for example Max Rheinstein and Hans von Hentig (since 1939). Most of her manuscripts remain unpublished, possibly as a result of the Hitler-Alliance (1942). After the bar examinations and obtaining American citizenship (1943) she influenced as a Marriage Counselor a model project for family jurisdiction in Toledo/Ohio (1944). In the reparation procedures of national-socialist injustices she supported German victims in the USA for lawyers in Germany (from 1945). While traveling in Europe and Germany she campaigned for democracy and equal rights for women (1946-1956). After postgraduate studies at Harvard University, she was awarded the academic Adjunct of Art Degree (1953). She lived off a pension from her reparation procedures until her death in Cambridge, MA. 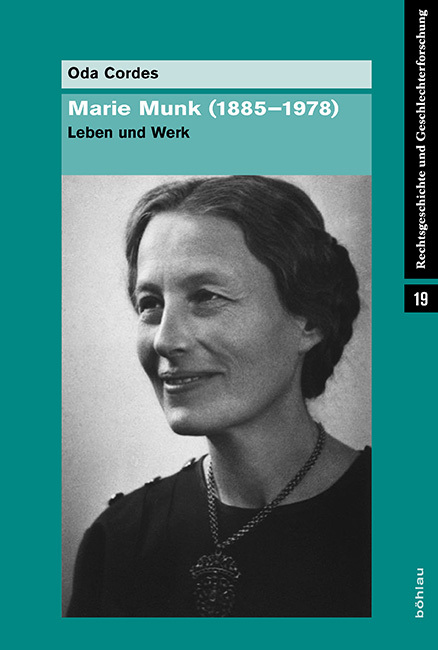 As the first female referee on the 33rd meeting of the Association of German Jurists (Deutscher Juristentag, DJT, 1924), Marie Munk influenced male jurisprudence over the community profits in the marriage law on property. Woman should not defer to man in marriage but be able to decide freely and alone on her property and her occupation and should be included in the marital profits after a divorce. Marie Munk campaigned for separation rights without questions of debt. She demanded that the marital breakdown would be based on the principle of irreconcilable differences in divorce law (25.DJT, 1931). The Scandinavian law was her model for a post-conjugal common right of custody of divorced parents and a common right of custody of the parents of non-conjugal children. Some accents of the failed Weimar reform became law after the introduction of Article 3 Paragraph 2, Basic Law in West Germany in 1957, in 1958 and in 1978. The husbands` sole rights to decide about every aspect of married life were revoked and a new statutory matrimonial property regime, the community of net property gains came into effect. The principle of irretrievable breakdown is sole ground for divorce since 1978. After the German unity a post-conjugal common right of custody of divorced parents became legal practice with the child custody rights reform in 1998 and in terms of procedural rules with the family rights reform in 2009. The common right of custody of the parents of non-conjugal children did not come into force until 2013. An interdisciplinary mediation before and during the family court procedure, a publicly financed health system, a uniform juristic education for all federal states complemented by the fields of psychology, educational theory and medicine for the United States of America are some her demands still not addressed to the present day. ∙Die widerrechtliche Drohung des § 123 BGB in ihrem Verhältnis zu Erpressung und Nötigung, Dissertation, Bonn 1911. ∙Vorschläge zur Umgestaltung des Rechts der Ehescheidung und der elterlichen Gewalt nebst Gesetzentwurf, Berlin 1923 (im Auftrag des Bundes Deutscher Frauenvereine). ∙Recht und Rechtsverfolgung im Familienrecht, Berlin 1929. ∙Oda Cordes, Marie Munk (1885 – 1978) Leben und Werk, Köln 2015. ISBN 978-3-412-22455-4. ∙Oda Cordes, Diversität des Wissenschaftsbetriebes in historischer Perspektive und der Versuch eines Ausblicks: die Situation vor 100 Jahren und heute am Beispiel einer Forscherin, in: Rene Krempkow, Phillip Pohlenz und Nathalie Huber (Hg. ), Diversity Management und Diversität in der Wissenschaft, Bielefeld 2014, S. 271-296. ISBN-13: 978-3-937026-87-9. ∙Oda Cordes, Èmigré jurist and transatlantic advocate for family law reform, in: Transatlantic Perspectives, German Historical Institute, Washington DC (Hg. ), February 06, 2013. ∙Oda Cordes, Die ersten deutschen Juristinnen und ihre Reformforderungen in der Weimarer Republik, Hamburg 2012. ∙Horst Göppinger, Juristen jüdischer Abstammung im „Dritten Reich“, München 1990, S. 305.